Boneyard's new brew is bloody good. Way back in the early 1970s, when I was a but a wee lad, my memories of beer were simple and innocent. Those recollections are basically distilled down to my Pop coming home from work and me bringing him his after-work beer, once we'd settled in to watch Laugh-In or Adam-12. One evening, though, my old man threw a wrench in our nightly routine when he opted to prepare his Olympia lager solo. Not only did he have the balls to shut me out of my sacred duties, he also proceeded to to pour tomato juice into the damned beer. Now, I wasn't a huge fan of beer or tomato juice; I'd ask for a sip of beer on occasion, but it would immediately be spat into the sink. So you can probably imagine my disdain for that murky red abomination that threw chaos into my hallowed suburban routine. Fast-forward into adulthood. After a week of sucking down Uinta Cutthroats and margaritas while vacationing on Lake Powell, a pal of mine from Colorado did the unthinkable: He poured Clamato into his Coors. If you're not familiar with Clamato, it's basically a combination of tomato juice and clam broth in a bottle. You can just imagine my reaction—but you'd be wrong. This alternative beer blend that broke my fragile adolescent psyche all those years ago was suddenly tasting ... OK. I'm sure it was beer fatigue combined with the savory zip of the Clamato, but I was finally a convert to the cult of bloody beers. Then, last summer at City Weekly's Utah Beer Festival, I discovered a home-grown option being made with one of Utah's most popular producer of bloody mary mixes. Boneyard's Bloody Blend has been making their special cocktail mixer since 2012—a spicy and savory tomato-based concoction that the manufacturer recommends you enhance with Clamato and vodka. For this special "bloody beer," the Woods Cross-based company has teamed up with Idaho's Laughing Dog Brewing Co. to produce a chelada-like beer that's worth checking out. 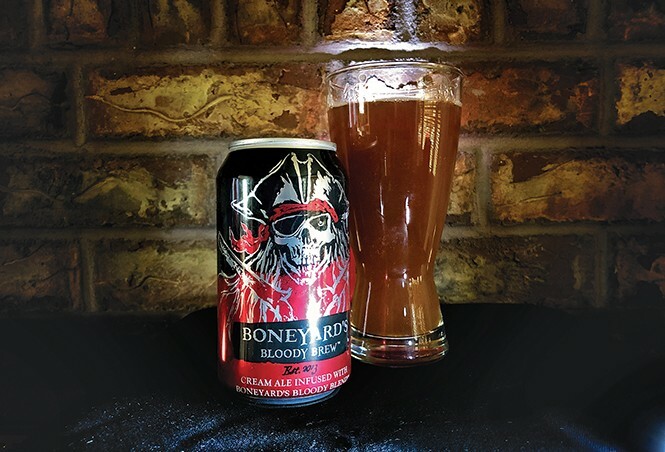 Boneyard's Bloody Brew is a beer that has an opaque (almost soupy looking) cardinal red color. The head is practically nonexistent. There is some froth that forms on the base beer, but it doesn't last long, and settles to a thin film on top. The nose is quite potent. Of course there's big tomato right off the bat, with some nice black peppercorn and a hint of poultry seasoning. It really stimulated the hinges of my jaw, causing a tingling sensation, and made my mouth water. The taste starts with tomato and pickle juice; light onion and garlic come in next, with black and cayenne peppers helping to round out the full body of the beer. The finish has a slight malt presence, but for the most part it's all about the juice. Think bloody mary with a bit of fizz, a tasty alternative to your standard lager or ale. Overall: This a primo breakfast or hangover drink. Bloody beers are also a nice change of pace when you want a beer, but "don't want a beer." I love it as a breakfast beverage, and I've found that it goes well with frittatas, bacon, eggs and breakfast burritos. I urge you to put your beer geek attitudes aside and check out this 4 percent ABV bloody mary-meets-beer refreshment. It's available in most grocery and convenience stores.